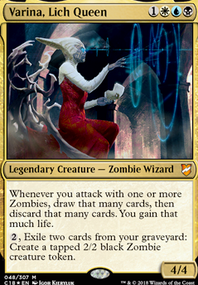 Alhammarret's Archive + Varina, Lich Queen and Zombies nets you cards and double life. Bonus points for Reliquary Tower or Thought Vessel . Aven Wind Guide + Cryptbreaker or Cryptbreaker + Intangible Virtue allows you to attack (with your many tokens) and tap to draw cards. Bonus points for Varina, Lich Queen , Alhammarret's Archive , or Throne of the God-Pharaoh . Embalmer's Tools + Throne of the God-Pharaoh deals lots of damage and mills lots of cards. Bonus points for Lich Lord of Unx or Endless Ranks of the Dead . Havengul Lich + Rooftop Storm or Liliana, Untouched By Death + Rooftop Storm can allow for casting all of your Zombies back from your graveyard for free/almost free. Bonus points for Wayward Servant or Diregraf Colossus . Nantuko Husk + Plague Belcher or Carrion Feeder + Vengeful Dead can dish out a lot of life loss with enough tokens. Anointed Procession + Endless Ranks of the Dead can get out of hand very quickly. Bonus points for Wayward Servant , Lich Lord of Unx , or The Scarab God . Gravecrawler + Rooftop Storm + sac outlet gives infinite Zombie casts and infinite Zombie deaths. Bonus points for Diregraf Colossus , Diregraf Captain / Plague Belcher , Wayward Servant , or Embalmer's Tools .